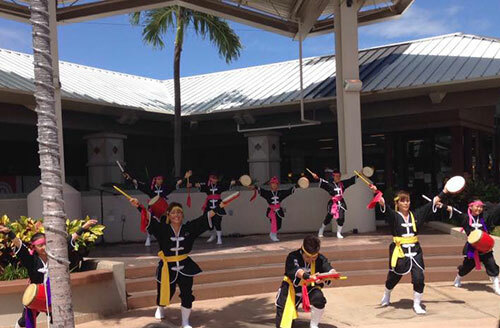 At the annual Maui Okinawan Festival, I heard three youngsters announce the songs they would be dancing to. When one of them added “and this one is my favorite,” I took out my iPhone to record it and began my journey of discovering this famous song about the Okinawan instrument. I shared it on my Facebook page so that I could check it out later. The familiar sound of sanshin accompanied all my eleven years growing up on Okinawa. For me, the three-stringed instrument is unmistakenably Okinawan. To see a song with that title perked my curiosity further. In the following video, I see that the song is used in a movie about a love triangle. It looks like Okinawa, for I see the sea wall, which I often cycled to, at sunset. What memories it brought back! I was sweet sixteen playing the keyboard. My friend Connie with her long straight hair was the lead singer and had brought me to this band. The other members were slender 18-year old Okinawan guys who spoke little English. We rehearsed and recorded on cassette but never gave a live performance. The guys took me and my girlfriends sightseeing and introduced us to cocktails. As you can imagine, listening to “San Shin No Hana” which most videos translated to “three wire flower” not only made me nostalgic for my youth but also created a burning desire to play the song. BEGIN is the Okinawan singer and songwriter who wrote this love song. Through Google, I found a webpage that contained the melody, lyrics, and chords. This is all I need to improvise on the piano. It would be nice to get the Romaji and English translation to introduce it to my “Music in World Cultures” class when we get to the chapter on Japan though. Click on the sample score below to get the 3-page PDF of the rest of the score, tabs, chords, and ukulele chord diagrams. Here is a san shin solo version. And here is a version with lyrics in Romaji and English translation in subtitles, thanks to my Kubasaki High School friend Diana who has been following Begin and other Okinawan music groups for years. We have forgotten the sanshin that grandfather left lying on the alcohol bottle. But found out if, take away the dust, and tuning the strings. In the past, I felt simauta was tedious but now I feel saudade. I sit down beside the TV where you had sat down before. Then I can see the moon through the window made of aluminum. How is the taste of simasake drinking with family? Who is singing a song? I heard the song when I fell asleep. I don’t care how many times sorrow and joy come. If all of sorrow and joy can change the simauta song. In soil, dry in autumn bare in winter, flower of sanshin bloomed in spring. sky? and sea is silent. carrying wind and rain to the island and flower of sanshin bloomed. dry in autumn, bare in winter, flower of sanshin bloomed in spring. ADDED ON 22 SEPT 2017: I finally found the time to put the melody, tabs, chords, and lyrics all together. See 3-page PDF.